Fri. Sept 14th.  9C  By 6:30 am, we were preparing for breakfast. Norm H. and John were able to attract the interest of a hummingbird as it briefly hovered between them  it seemed anxious to be on its way - our tripping instincts told us the same. The sun had already risen over the ridge and the clear sky and gentle breeze indicated that we were going to enjoy a sunny and warm day for a change. We would be tested again on this day because of two long and arduous back-to-back portages to Nellie and Grace Lakes. 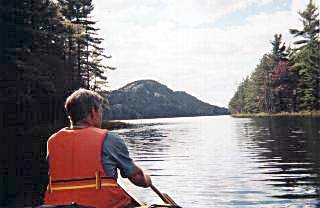 We were on the lake by 9:15 am paddling towards our first portage (29P2525) located in a small cove. 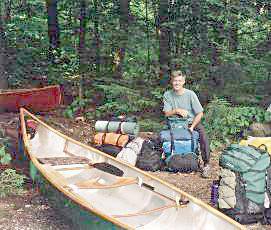 Our portaging had become very systematic with everyone carrying an equal weight during the two trips  the first with the equipment and the second, the canoes and accessories. We climbed over a small ridge and through rough terrain for the first 600 metres. As we entered the eastern side of a bog, we were faced with a walk on top of a beaver dam (BD 10) before crossing a shallow stream. The changing of footwear from canoe shoes to hiking boots was necessary for these long treks; however, slipping into cold, wet canoe shoes wasnt always that pleasant! Our load was heavy, but we found the hike through the woods, with the sun shimmering through the trees a refreshing experience. The trail provided a gradual but persistent climb along an old logging road with an 80-metre rise in elevation to Nellie Lake. The rugged terrain, maneuvering in and around trees, climbing over rocks, roots and walking over planks placed over streams and wet areas were part of the obstacles we had to endure over two escarpments it was the second time that we encountered a strain on both our thighs and shoulders. Near the end of the portage, we left our equipment along the trail and the return walk to retrieve our canoes gave us a chance to rejuvenate our muscles. 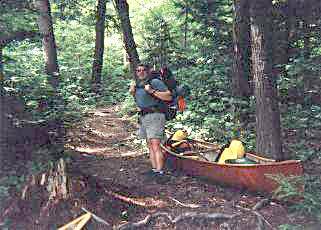 On our return trip with the canoes, John yelled out for us to drop our canoes because a black bear, standing on its hind legs, was observing us approximately 100 feet up the trail. Based on its size, we calculated the bear was about two years old, and probably abandoned by its mother. We took the proper precautions to prevent a bear attack and waited for it to react to our presence (see the Black Bear and You). Norm H. was ready with his "First Alert", a hand-held high pitch alarm, and "bear deterrent" spray in the event that the bear became aggressive. After what appeared to us to be a very long minute, the bear slowly went down on all fours and retreated into the woods. Determining that it was safe to continue on with our portage, and carrying our canoes high over our heads to make ourselves appear as "big and tall" as possible, we ventured forth, at the same time, surveying the woods for the bears presence  we were not disappointed as, standing on all fours on a small knoll about 75 feet away, was our sentinel of the wilderness! Normally, most black bears would dart off into the woods at the presence of humans, but not this one - Norm H. was at the end of the line and vigilantly surveyed the area in the event of a sudden attack. We stopped a short distance along the trail to determine whether the bear was following us either on the trail or parallel to it in the woods. Norm H. noted that we had interrupted the bear while it was eating acorns along the trail and hopefully, it would continue to feed and not bother us. 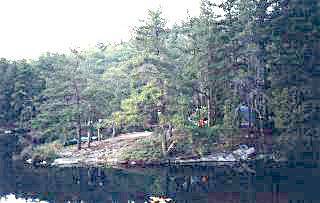 At the end of this long journey, we stopped for lunch and Norm H. took a swim in the aqua waters of Nellie Lake, which is considered to be the highlight of a trip to the northern boundary of the park. The crystal clear waters and rolling shoreline covered in pine and oak illustrates why this lake has been a favourite to so many. Paddling through the narrow channel leading into Carmichael Lake, we took note of the waters pristine condition  we stopped paddling to look over the canoe to vividly see boulders and fallen trees at least 40 feet below the surface. 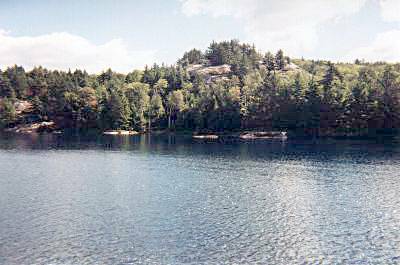 It is said that in some areas of the lake, one can see down into its depths as far as 80 feet. 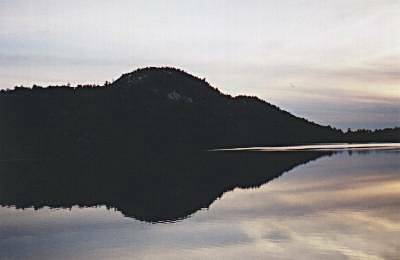 If we perceived that our first portage to be strenuous, then the long, steep incline observed at the base of the next harrowing portage (30P2085) to Grace Lake was only an indication of what was about to come  we would later refer to this portage as the "mother of all mothers". The climb up the escarpment with a 65-metre gain and then an 80-metre drop in elevation seemed to go on forever  taking us through a valley of hardwood and hemlock with a rolling and rutted terrain. With leg and back muscles straining to their limits we finally stopped at the summit for the first of three such breaks, to unload our equipment and return to retrieve our canoes. Just as we were beginning to think that we were on the home stretch after hiking down a ridge into a ravine with a stream running parallel to us, we were confronted with our second escarpment. The prolonged and strenuous exertion during the first portage in the morning had zapped much of our strength, and as a precaution, we undertook to drink more fluids and eat more snacks to maintain our stamina on this second route. Occasionally we would see signs that animals had been on the trail at one time or another. A large garter snake passed in front of us and we took time to admire its beautiful markings and take a breather. 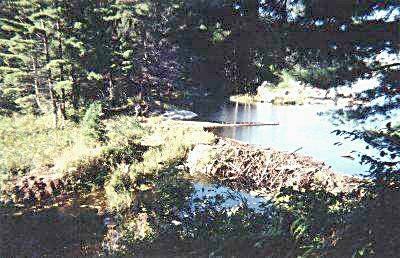 At the foot of the second escarpment, we came upon a beaver dam (BD 11) and pond that were easily passable. 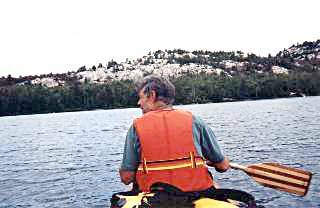 We were soon upon spectacular Grace Lake with its picturesque islands and surrounding quartzite ridges that plummet to the lakeshore. 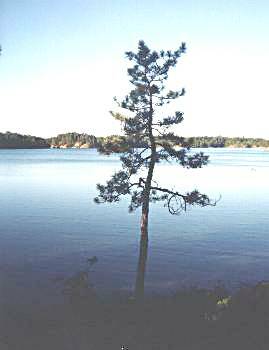 Weathered pine trees clung tenaciously to cracks and fissures on the lakes small islands. As we approached the middle of the lake, our intended campsite located on a peninsula was occupied as well as the campsite at the end of the lake next to the portage. The last available campsite (6 Site 181) at the eastern portion of the lake would be our home on the last evening of our trip. Slightly tired, we set up camp at our own pace and recouped our strength with hot soup and snacks. Norm H. and Wayne fished for a while, but without success - we never saw any fish leaping in the lakes throughout our trip, possibly the result of the lakes still being affected by acid rain and the pollution from the mines in Sudbury. The closest that Wayne came to catching anything was a loon that was suddenly attracted to his "prize" lure  that ended our fishing! 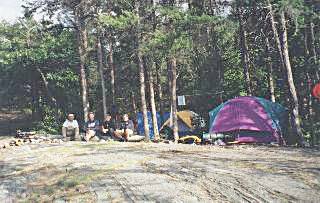 We ate like "kings" for supper and sat around a roaring campfire to exchange stories and reflect on the weeks adventure  a very memorable trip of challenges and comradeship that was toasted with the last sips of "medicinal" scotch. Serenity was broken as dusk overtook us and we prepared for bed - the evening chill of 10C put us deep into our sleeping bags by 10:15pm.